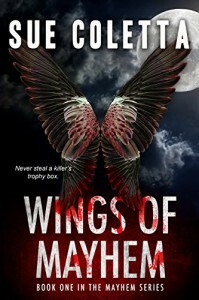 I have read several books by Sue Coletta and she gave me Wings of Mayhem just because. I love serial killers…well, books about serial killers….and Sue kept me enthralled in the first book of The Mayhem Series. Starting out with a fabulous cover by Elle Rossi of EJD Designs, is always a good sign. Cat burglar Shawnee Daniels always believed her “fearlessness rules” mantra would keep her on top and out of jail. When she hacks a confiscated hard drive at the Revere P.D., she focuses on a white-collar criminal accused of embezzlement. To teach him a lesson and recoup the funds she breaks into his massive contemporary in Bear Clave Estates. Jack has even more secrets, deadly secrets, secrets worth killing over. Shawnee thinks she made it out clean until a deadly package arrives at her door soon after. He’s found her. As a glowing eagle taunts her Skype screen, Jack tells her she stole his precious trophy box — and he wants it back! When her “helpful” best friend convinces her to date charismatic Detective Levaughn Samuels, her two worlds threaten to implode. Ordinarily Shawnee keeps a firm line between her professions, but dating Levaughn might help her get this psycho off her tail. If she doesn’t find the trophy box, the killer’s coming for her. 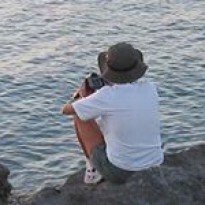 If she doesn’t expose her secrets and lies, more will die. And if she does, she could lose her freedom and everyone she holds dear.